We admittedly did not fully anticipate the market to fall so quickly. We thought the 143.75 level would be at least somewhat defended. The pattern is not quite complete yet, although the MTFS white line may imply some cooling down. The sentiment is still quite negative though. I warned to be careful about the triangle breakout... could not be more right, could i ...? 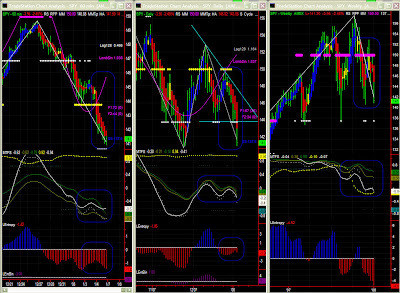 Surprisingly, MTFS and Entropy are not overly bearish yet, so we can see it either as room to fall further (137.75?) or maybe a sign it will be soon over (140.6?). Quite a volatile environment... This time frame has difficulty adapting to the current market moves at the moment. We would like to see Entropy stabilising for a possible recovery. We have to watch current levels or possibly 137.75 for support now.